Martha Sharp with her husband Waitstill, 1939. Credit: Yad Vashem. The year was 1938 and the Munich Pact allowed the German annexation of the Sudetenland – an area of land bordering Czechoslovakia. This agreement shocked Christians in the United States who had close ties to churches in the region. Czechoslovakia had been a refuge for German and Austrian Jewish refugees fleeing the antisemitism of the Nazi state. After seizing power, the Nazi state began economic boycotts of Jewish businesses. Antisemitic violence soon followed. German Jews were purged from the civil service, many were unable to practise law or teach in schools and universities. By 1933, the Nazis had outlawed kosher traditions. Jewish students found it harder to gain access to education. Members of the American Unitarian Association (AUA) worked with a delegation of Quakers to understand the scale of the problem facing refugees in Czechoslovakia. In November 1938, Dr. Robert Dexter, who headed the AUA’s Department of Social Relations, and a Quaker representative named Richard Woods, sailed to Europe. Within weeks, they had made connections with other Unitarians and allies across mainland Europe. A report published on November 16 revealed that 200,000 refugees had fled the Sudetenland into Prague. Dexter and Woods estimated that 22,000 to 26,000 refugees were in need of immediate emigration relief. They recommended that Unitarians focus on supporting Jews and anti-Nazi Germans from the region. Unitarians and the Czech relief committee had raised more than $40,000 to assist. Rev. 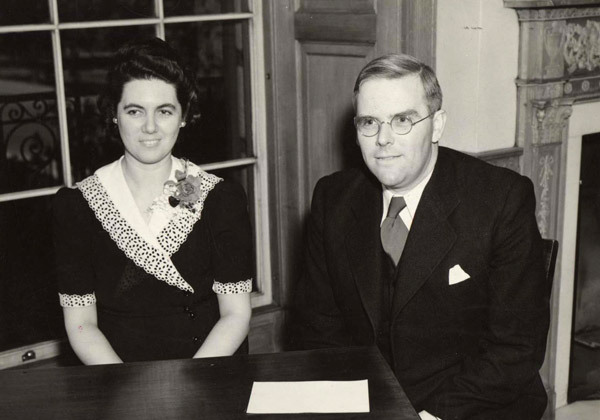 Waitstill Sharp, a minister from the Unitarian Church in Wellesley, Massachusetts, and his experienced social worker wife, Martha, accepted the request to assist refugees in Europe. Despite their misgivings about leaving their young children with family members, their deep religious conviction and moral outrage put them on a ship to Europe which departed on February 4, 1939. The Sharps arrived in Czechoslovakia on February 23. They soon contacted personnel in the Red Cross, Salvation Army, the US Consulate and Czech officials to assist refugees. Bilingual Czech students helped them document the varying needs refugees. This included helping them finding the relevant scholarships or employment opportunities to emigrate. Or bringing their cases to the attention of various European embassies. Their relief work grew more complex when the Nazis invaded Prague on March 15. Martha Sharp was still able to travel around Europe under the guise of her husband’s ministerial visa because it was issued before the Nazi invasion. On the six trips to contacts across Europe, Martha helped 35 refugees enter England. The group included artists, intellectuals, and two children who lost their parents to suicide. In four months, the Sharps had provided meals to 390 Austrian and German refugees. They donated money to child relief projects and shelters. The threat of Nazi violence hung over the Sharps during their stay. In April 1939, the Gestapo raided the offices of the Unitarian mission in Prague. Yet their commitment to helping Jewish refugees and opponents of the Nazi state was unwavering. Martha Sharp had moved their office to a new location, until fresh raids had also shut it down on July 25. In August, Waitstill Sharp had left for Switzerland to attend a conference. He was then denied re-entry into Czechoslovakia. During this period, the Nazis had shutdown all foreign offices in the country. Martha Sharp did not leave until August 15. She would later learn that the Gestapo had intended to arrest her on August 16. The Sharps were reunited in Paris and soon departed for the United States. Before they arrived home, the fog of war had consumed parts of Europe. Nor did the pre-war heroics of the Sharps end in 1939. A year later, they accepted a new Unitarian mission in France. Yet a day before departure, Nazi forces invaded Paris. This brought a change of plans and the mission entered neutral Portugal. After arriving in Lisbon on June 20, 1940, to coordinate relief work. The Nazi-puppet regime of Vichy had meant that the south remained unoccupied. So the Sharps picked Marseille as their other base of operation. Examples of their relief work included providing malnourished children with powdered milk and helping Czech soldiers who fought in France flee. The Emergency Rescue Committee (ERC) worked to rescue intellectuals, artists, musicians, political activists, many of whom were Jewish, to escape France. Waitstill Sharp worked with the ERC to help with the emigration of 200 refugees. One of the names on this list was the renowned German-Jewish author Lion Feuchtwanger. He escaped Nazi Germany in 1933 and remained a stern critic of the regime while living in France. War made his status in France precarious and dangerous. Under the French-German armistice agreement, signed after the defeat of France in June 1940, required the French government to hand over any German to Nazis upon request. Feuchtwanger’s wife Marta had enlisted the support of Myles Standish of the US consulate in Marseilles to assist. Learning of his plight from a contact in the ERC, the Sharps took it upon themselves to assist the Feuchtwanger’s. Lion Feuchtwanger received a new identity card with his last name translated as Wetcheek. The detailed rescue plan involved Lion Feuchtwanger fleeing in women’s clothing. Entry back into Spain was made possible thanks to his new identity card. The group took a train from Madrid to Portugal. Waitstill Sharp sat with Lion Feuchtwanger in first class, as his wife Marta sat in third class. This was a tactic to avoid suspicion from Spanish police. After all, Spain was under the dictatorship of the fascist Franco regime, who were sympathetic to the Nazis. Their arrival in Lisbon was short lived as they soon departed for New York. This was only possible after Martha Sharp gave up her ticket. Martha Sharp, however, had returned to France, and managed to secure permits for a group of children – nine of them Jewish – to leave France. By December, Martha Sharp helped 27 children and 9 adults flee to New York. The Sharps divorced in 1954. They often avoided discussing their activities in Europe. Waitstill died in 1984, and Martha in 1999. A curious grandson helped bring their story into the public domain. For their actions, Waitstill and Martha Sharp earned the title of Righteous Among the Nations in 2005. On September, 20, 2016, a documentary titled Defying the Nazis: The Sharps’ War aired in the United States.